I recently came across this (older) article in Entrepreneur written by Jane Porter. The content is on point whether you still need to select a tax preparer for this year or you need to reassess your current provider. At this point, if you still need to select a provider to prepare your 2016 taxes, you are a little late in the game and should file an extension. Most firms are already sold out between now and April 15th, especially with the March 15th deadline for LLC’s. That being said, most firms are very entrepreneurial and can find room to fit in “one more.” When you are selecting a provider, the questions below can be very helpful in making sure you select the right firm, and the right person within that firm, for your business, industry, size, structure, goals, etc. If you already have a provider, I would use these questions as an opportunity to have a conversation with your provider. As your business grows and changes, your tax provider may also need to change. Has your business become more complex? Have you added new legal entities and/or additional partners? Have you opened new offices in additional states? Are you going international? Are you inquisitive? You want to make sure your accountant understands your type of business. A restaurant will have certain rules to follow for wages and tips, for instance, just as a construction business must deal with issues related to contract workers and a real estate development firm will have certain criteria about how income is reported. You need an accountant who has worked with other businesses like yours and knows the ins and outs of the industry. What’s your experience with the IRS? “Accountants will often outsource work to a third party. This doesn’t mean their services are bad, but you want to be sure they are forthright about who is doing the work,” says Kerry Kerstetter, a Harrison, Ark., CPA. “If you want to talk with someone familiar with your bookkeeping and that’s a third party, it likely will be difficult to speak with him or her directly,” Kerstetter says. Some accountants want to write off everything they possibly can, while others take a more conservative approach. “It’s important to figure out where you fall on the spectrum and find an accountant who agrees with your philosophy,” Lyon says. “If accountants tell you they specialize in finding red flags that could trigger audits, they may be hesitant to maximize your deductions. For example, some accountants believe taking a home office deduction might be a red flag to the IRS,” Lyon says. Some accountants charge by the hour; others bill a flat rate. “If you want to take a more hands-on approach to your bookkeeping, an hourly rate might be better because you won’t have as much continuous work for an accountant,” Kerstetter advises. Regardless of the billing approach, be sure to get an estimate of an accountant’s likely fees. “Provide a copy of your previous year’s tax returns so the accountant can familiarize himself with your business before giving a quote,” Labant says. If you have more than one entity under your name, be sure the person you hire can manage them simultaneously–a skill not all accountants possess. “If you own rental property as an LLC and a retail store registered as a C-corporation, for example, you’ll need an accountant who can coordinate and track money moving between those entities,” Kerstetter says. “This question may seem technical, but not all accountants will know about this plan, which allows you to deduct your family’s medical expenses on your return,” Lyon says. If the accountant you’re speaking with is unfamiliar with such plans, you should be wary because that might be a red flag that he or she isn’t well versed in deductions that could save your business money. What tax programs do you use? You shouldn’t choose accountants based on the tax programs they use, but it’s a good detail to ask about. “QuickBooks is commonly used for small businesses, which means your information would likely be easily transferred between different accountants,” Kerstetter says. Hiring an accountant who uses more obscure tax software won’t affect the quality of the work, but it might make it tricky to switch accountants. How often will we communicate about tax issues? 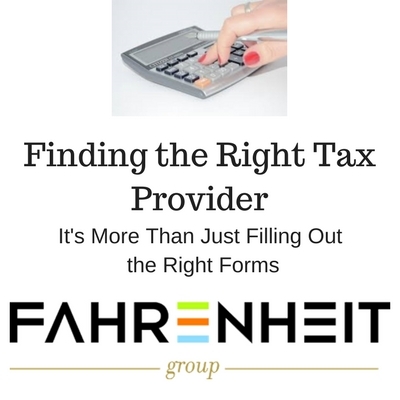 As you navigate tax provider decisions, feel free to reach out to anyone at The Fahrenheit Group. We work with over 100 companies providing fractional CFO/controller and middle-market consulting services. We know the tax provider landscape and can help you maximize the relationship.